When I get the opportunity to wear a skirt or a dress for an outing, you know I'm going to always step it up. I work from home, so my outfit during the week and weekends is always jeans and a tee. It's what I'm most comfortable in, but also fun to style with a change of shoes or handbag. I got this skirt on major sale and could not wait to wear it. After having my son, I didn't think I could wear a crop top again, but I pulled it off subtlety here. The skirt is high waist and sits right above my belly, so just a peek of skin showed. The jean jacket added the perfect touch to say "hey, look at me and how cute I look in this outfit!" Or at least, that's what I was saying in my head. You are totally rocking that look! LOVE that jean jacket. Super cute! I know we're supposed to be looking at the skirt, but the shoes are my fave! What a great skirt, I can already imagine all the things you could pair with it. Love, love, love those booties! Hi Crissy visiting from SFH linking party ... love how you paired the jean jacket it with this outfit. Love the skirt and the color. It goes perfectly with the denim jacket and your beautiful grey shoes. 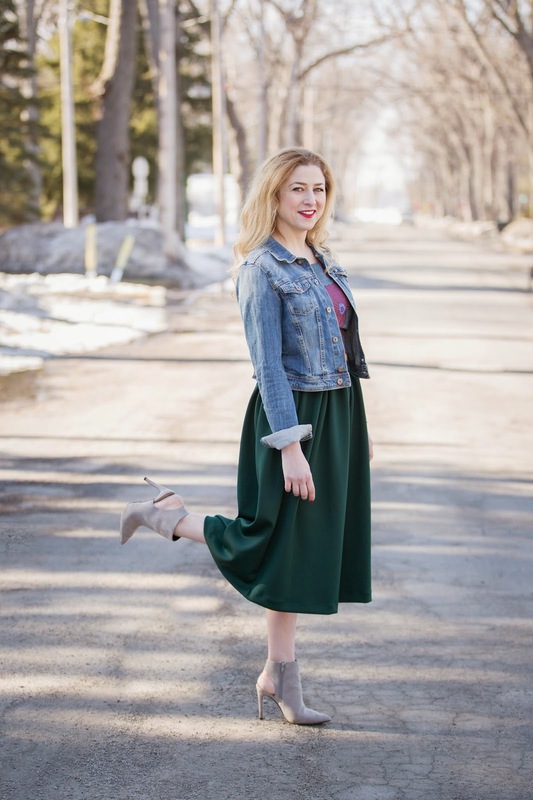 Cute transitional look for Spring! 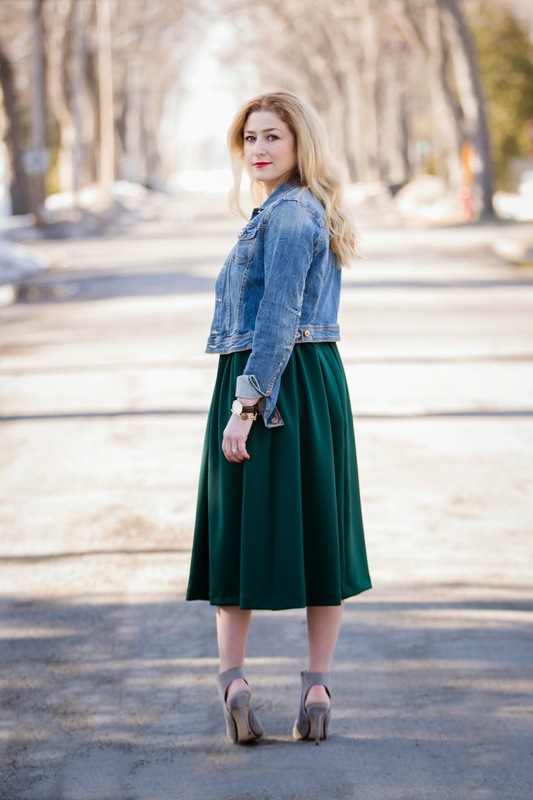 Loving this midi skirt and how you've kept the styling more casual! Great look. Really digging that skirt-the color is so rich and you look great in it! Love how that skirt moves. Thanks for linking up! Cute outfit! Love the skirt and especially the shoes! Loooove that skirt! So bummed it's sold out! High waisted skirt + crop top is one of my favorite looks! Work it! That skirt is fantastic! But your jean jacket is what stole the show for me. I love how you tied the outfit together with it and I love my jean jacket. Gorgeous! I've always wanted to get away with a high waisted outfit and a crop top but I just can't! I look and feel weird! But you pull it off perfect. 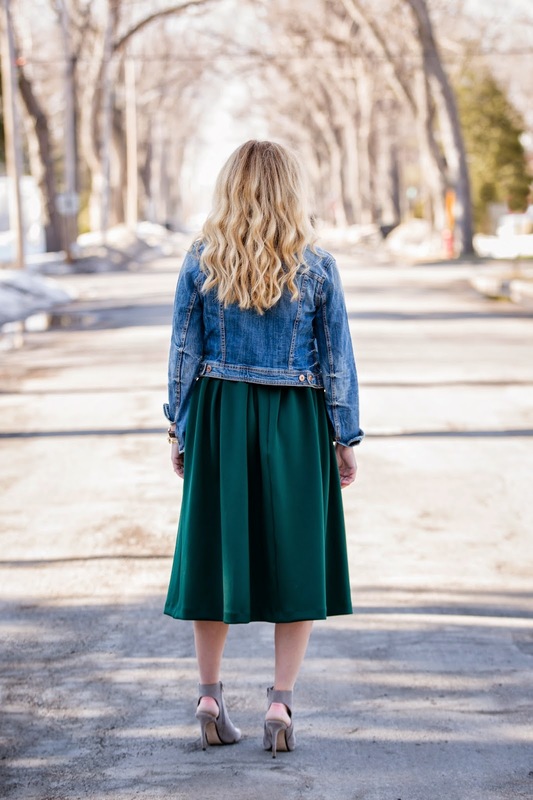 I am just in love with that green skirt. Great pics! I just came from the What I Wore Link Up. I love this outfit. So unique! You look awesome in a crop top - nothing to worry about! Thank you for joining TBT Fashion link up and hope to see you Thursday.